...but if it doesn't work, you could easily end up doing far more damage to the frame which would result in a far larger bill. Don’t make it too huge DIY job. Just get a two compound glue that’s is able to repair weight-bearing parts and that should harden strong enough to keep the hinge in place once and for good. Just get a two compound glue that’s is able to repair weight-bearing parts and that should harden strong enough to keep the hinge in place once and for good. Verbier's proposed glue should be good enough, though, right? I could not use any instant setting glue, as it will take a minute to align it properly before letting it set. My concern is that the hinge is already a tight fit. I'm not sure how easy it will be to get glue in there around it. This said, I still have the feeling it will work. Indeed... I am mulling it over! Redrill the hole by 0.5mm - 1mm dia. or so larger if necessary. I have a feeling that it won’t be necessary. There are types of glues on the market nowadays that will hold an elephant upside down on the ceiling. Use the one that consists of two compounds i.e. glue and hardener 50/50 proportion. Align the hinge. Wait out their recommended time 24h or so until it dries out completely. That is basically my method using a rag as a filler -I would prefer something more solid as a filler (eg No 8 wire ) Whatever method you use, the alignment of the top and bottom hinges is critical, which is the reason for attaching the door when fixing the hinge. You need to support the weight so that the hinge does not move. There are types of glues on the market nowadays that will hold an elephant upside down on the ceiling. Hardwood shims, driven into the epoxy filled void would probably be strong enough. The hard part would be keeping the epoxy in the space while it cures. Who knows if there's a void behind that facing board. And... if it has to come out for any reason... good night John Boy. On a serious not though. If the hinge, in the first place, fitted perfectly before, then it is just a matter of putting it back where it belongs. If you don’t wanna do to much of carpentering work just go to Jumbo or Obi straight to the glue department. That’s my 5 cents. @Jag: Most likely what would help would be to redrill the hole slightly larger to let the epoxy breath during solidifying process. Gravity is less effective in large gaps? That's news to me. He won’t be able to remove that hinge later. It will defy the law of gravity. My point was that the epoxy will follow the law of gravity and run out of the gap before it cures. Poking shims into the space will mean that the glue only needs to hold the shims in place. It's not unusual for the door frame hinge side to be bolted in place and only the door side can be adjusted. For hinges for heavy doors with two screws/bolts on them it is the only way. If everything is fitted in the right place you don't need to adjust, right? If I were the op I might first try glueing it but otherwise measuring where the hole is and trying to locate where the side screw could be on the frame would be the other option. There is the way. If you wait until the adhesive becomes less liquidy after few minutes then no issue with escaping from the slot. It’s 90min workable which means you need to wait a little bit before applying it at the final stage when it starts hardening. Last edited by jacek; 10.02.2019 at 21:26. Our house has quite a few different hinge types as well. The style that you have is held in place by a large nail through the door frame into one of the holes that is shown on your removed hinge part. Perhaps the original constructors forgot to add the nail and over the years, it finally worked itself free. I replaced a few of these door frames a few years ago and it was next to impossible to remove the nail without destroying the frame (trying to separate the metal from the wood for recycling). I would measure the distance to one of those open holes and then drill a precise pilot hole into the door frame. Using an appropriately sized nail, drive it through. No more worries. I wouldn't mess with adhesives in this situation. On a second look while zooming your 2nd photo: Is there a 3rd hole between the two open ones? Lighting is kind of funky but could there be the remains of the sheared nail in a 3rd hole? 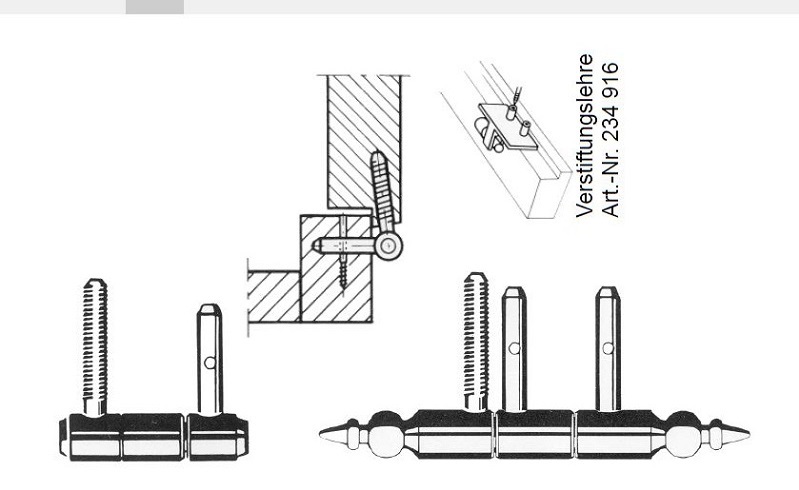 The joiner uses a jig (Verstiftungslehre) to drill the holes in the frame in the precise position to match up with the hole(s) in stud which penetrates the door frame. I am now favouring the drilling and nail solution actually, as I see that it would be possible to drill in the outer frame with the smaller of the two holes on the hinge. As in the diagram directly above.